It may not be a surprise that Monaco went into the November international break in the top three of Ligue 1 and firmly in the hunt for this season’s French title, following their promotion from the second tier last season. But what has been a shock for observers of French football is that another newly promoted side, Nantes, will be the highest placed of the three sides promoted from Ligue 2 last year should they beat the big spending principality outfit in the next round of fixtures. Les Canaris signed off for the international lull in some style too, recording their biggest ever win away to Bordeaux in the ‘Atlantic derby’ of France’s two west coast rivals. The 3-0 victory at the Coupe de France holders was achieved in some style, and thanks to the ruthless finishing that has served them well all year. Key to their form has been the outstanding goalscoring of Filip Djordjevic, the Serbian striker who was with the club when they were relegated five years ago and has struck eight times already this term. Nantes did their summer shopping in the rather untapped Venezuelan market. Fernando Aristeguieta and Gabriel Cichero were signed permanently from Caracas FC, whilst compatriot Oswaldo Vizcarrondo was brought in from Argentine side Lanus. Thanks largely to a resolute defence combined with their ability to hit opponents with sucker punches, Nantes have climbed the table and go into the game with Monaco on a run of just one defeat in eight games. They are a well-balanced side, reflected by the fact that they have both the third best defensive record and third most prolific attack in the league. It is easy to forget as well, with all the headlines about Monaco, that Nantes are historically one of France’s biggest names and were it not for the extravagance of the principality club there would have been much more fanfare about the promotion of Michel der Zakarian’s side. But Les Canaris are not the only ones causing a stir on their accession to the big time this year. After Nantes have played Monaco, their next opponents will be the other newly promoted side, Guingamp, who have also been a surprise force in the top flight and appear to be on course to comfortably remain in the division at the end of the season. Unlike Monaco or Nantes, they made a very slow start. Two successive defeats to open the season and just one win in their first six games left them languishing just clear of the drop zone, where they will have expected to be. However, a 5-1 thrashing of Sochaux precipitated a run of four wins out of five, inspired in large part by the goals of Mustapha Yatabare. Guingamp also boast the talents of Thibault Giresse, son of Alain Giresse, a key part of the ‘magic circle’ in the France midfield of the 1980s alongside Michel Platini, Jean Tigana and Luis Fernandez, which won the European Championship in 1984. Guingamp’s sparkling recent form has catapulted them up the table. Indeed after beating Ajaccio on matchday 11, all three of the promoted sides occupied positions in Ligue 1’s top five spots. To a large extent this state of affairs reflects the finely balanced and competitive nature of French football. If England has the most open title race of Europe’s biggest leagues, France has the most open league from top to bottom, and Ligue 1 can proudly say that it is the most even top flight. As the season goes on, the story will surely become more and more about Monaco. A flying start put them top of the table by week four and they remained there throughout September and into October, before being toppled by Paris Saint-Germain. Yet it still took until the 12th round of fixtures and a visit to in-form Lille for Claudio Ranieri’s side to finally taste defeat. They have endured the most mini of wobbles of late, but still boast the division’s top scorer and goal creator so far in Colombian duo Radamel Falcao and James Rodriguez. 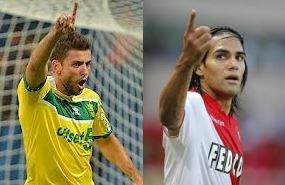 Monaco’s return to Ligue 1 has shaken up not just the French game, but European football, with the arrival of Falcao the highlight, whilst Rodriguez and Joao Moutinho are hardly slouches. And then there are also Ricardo Carvalho, Eric Abidal, Geoffrey Kondogbia and Jeremy Toulalan. Three years ago, in their last Ligue 1 campaign, Monaco were in the relegation zone at this point of the season. This year is their best start to a season since 2003/04 when they reached the Champions League final, although considering the talent at their disposal many would argue that their opening Ligue 1 push has only met minimum expectations. For all the furore that surrounds their tax free status, with French clubs angry at the competitive advantage that gives them, and a proposed threat just a few months ago to prevent them competing in Ligue 1 this season unless they relocated their offices to France, there is little doubt that Monaco’s return to the top flight is good for football in the country. At a time when there are worries aplenty, with promising talents like Yann M’Vila and Charles Kabore being flogged to Russian clubs willing to pay them higher salaries, the talent drain that threatens the French game is held up to some extent by Monaco, as their vast wealth permeates across the league, the principality outfit snapping up bright young talents from rivals. And with Paris Saint-Germain threatening to become the dominant force, they need a rival to keep them on their toes. Their rivalry with the Parisians, and the parallel battle between Zlatan Ibrahimovic and Falcao, is great for France. And that is without even mentioning €64.5m man Edinson Cavani. However, for all the headlines prompted by the Monegasque spending splurge, Nantes and Guingamp have made a point this season – that it is not just all about Monaco. There were three teams promoted last year, and it is the less heralded duo who have so far exceeded expectations most of all. And should Nantes continue their fine recent form and capitalise on Monaco’s recent wobble, they will sit proudly above the big spenders from the south as November reaches its conclusion. Like to bet on football? Pay Inside Bet a visit!